Slow cookers are one of the most popular kitchen items in the country. Recipes that utilize these modern marvels are surprisingly simple – just add ingredients and wait, right? Whether you enjoy crock pot cooking because your schedule is hectic, or because you crave the slowly simmered tastes such recipes provide, here are a few tips and tricks that you can use. Crock Pot Care: Chances are that your slow cooker has a ceramic plate on the bottom. That plate can crack if exposed to abrupt temperature shifts. This means you should avoid placing frozen foods directly onto the hot plate and allow them to thaw first. Likewise, avoid taking the hot plate out and immediately placing it on/in something cold (like water for cleaning). The Right Meat: Not all cuts of meat cook the same. Thicker cuts with more marbling are likely to breakdown in your slow cooker, which is delicious. Thin cuts, however, will likely dry out. Remember that fat in marbling is different than fat around the edges. Don’t be afraid to trim excess fat from the edges of your cut before cooking so you don’t end up with greasy cooking liquid. Pre-Cooking: Though some of the most popular recipes require little prep work before turning on the slow cooker, some wonderful elements can be added beforehand. Browning meats and vegetables can add flavor to the end dish. Likewise, a bit of flour before browning can make gravies thicker. 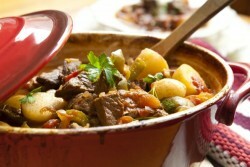 Lid Guidelines: There are two important things to keep in mind with the lid of your crock pot. Number one: Don’t touch it while cooking. Every peek into the slow cooker can add 15 minutes to the cook time. Number Two: Since certain flavors won’t be evaporated out of the crock pot (like alcohol), a little bit goes a long way. “Oops” Means Start Over: If you set up your delicious meal in the morning and return to find that you forgot to turn the crock pot on, or only set it to “warm,” throw the food away. Bacteria thrive at these temperatures and your delicious ingredients will likely be unsafe for eating. The good news is that you’ll be able to try again tomorrow. Chances are all this talk about slow cooking has worked up your appetite. Not to worry. Before you go, copy this recipe for Old Fashioned Potato Soup! Combine first 8 ingredients in a 4 1/2 quart slow cooker. Cook, covered, and on high for 3 hours or until vegetables are tender. Stir together flour and milk; stir into soup. Cover and cook 30 minutes or until thoroughly heated. Garnish with parsley before serving.